So it has been a few months since I've been thinking about getting myself a small video camera. Not a big HandyCam type, but the small home movie type. I have been researching this for a bit now and it seems there are only three good options available to me for the amount of money that I want to spend. 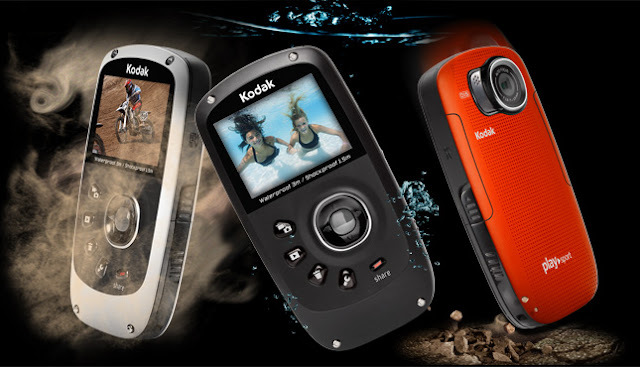 The GoPro series, the Flip Series and the Kodak Zi8. The latter has been in active development and had a few recently upgraded models available. The GoPro was a bit expensive and was designed for extreme sports and fast action recording. Surprisingly, The Flip wasn't available anywhere and I read somewhere that the company has gone belly up. So, the only real choice for me was the Kodak models. Kodak has a few models available right now but what I had a good look at was the KODAK PLAYSPORT Video Camera. It looked good and the specs were nice enough. FULL HD 1080p recording. HD 720p@60fps for fast action recording. Dustproof, shockproof and waterproof down to 10feet. I read a few only reviews, watched a few YouTube videos reviews and I was sold. So last week I got on the internet and ordered myself the KODAK PLAYSPORT Video Camera Zx5. I went for the BLACK version. Black Friday and Cyber Monday deals were in full swing. I crashed the party as well and got a steep discount. Good timing I guess. My camera has shipped and is on the way here now. Can't wait to get my hands on this and shoot some baby videos. Looks like I can do exactly that later this week. Also, I guess now I need to familiarize myself with some video editing software. Come to think of it, I have never even opened up iMovie, ever. Not once. would appreciate if you could point me in the direction for home video editing. Nothing fancy, just trimming and adding audio tracks and stuff. Thanks.